Nothing that great at the box office, this weekend, but the smaller movie is the far more entertaining and interesting one. * War For The Planet of The Apes – Rated PG-13: More like, “Apes’ Lives Matter.” I hated this movie. It was soooo long (clocking in at nearly 2.5 hours), soooo boring, and soooo over the top political. Subtlety is nowhere to be found in this. The villain is clear: White Christian American males who serve in the military. And the apes, though completely murderous (they kill an innocent man who puts his hands up), are the heroes, the protagonists. On top of that, the imagery is unmistakable and offensive. This movie comes complete with Ape Auschwitz (surrounded by barbed wire), where the oppressed apes are imprisoned, starved, and forced to do hard labor, while they are harassed by soldiers with dogs, and murdered (I also recall hearing the number “six million” mentioned). There are also ape kapos, called “donkeys” who help the human soldiers discipline the apes in the camp. Oh, and the concentration camp is run by the chief evil White male–Woody Harrelson, who wears a giant cross, is patriotic, and has his soldiers sing the American National Anthem. (America is evil. Got that?) The whole thing is incredibly offensive to me, since my maternal grandparents were Holocaust survivors and most of both sides of my family were murdered by the Nazis. In previous contemporary Apes movies, we’ve been told that the imagery is meant to be about racism and the apes are the Blacks. Yes, Hollywood engages in one of the oldest, most reviled comparisons of Blacks to animals and not only gets away with it, it gets praise from legions of mind-numbed mainstream (a/k/a liberal) movie critics. 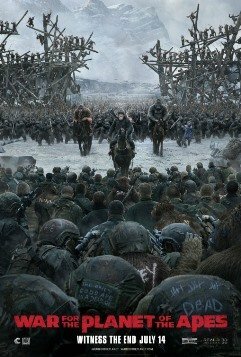 One other annoying thing in the movie, and that thing is clearly propaganda: the human soldiers (led by Harrelson) are forcing the apes to build a wall to keep the apes out. Ah, I see, the apes are illegal aliens . . . er, “undocumented citizens.” One ape on the outside asks, “Why do they need a wall?” Uh, maybe to keep dangerous parties out. The story: apes, led by a renegade evil ape, have gone to war against humans, as a result of a “misunderstanding.” That and disease have picked off most humans and there are only a fraction remaining. The humans are fighting the apes, too. And a large contingent of them are led by an evil, egomaniacal, White Christian male (Harrelson). Soon, many of the apes are rounded up to a concentration camp led by this commanding officer. An ape from previous Apes movies, Caesar, is the only ape who can speak English and communicate with humans. He is leading the apes. He says that the other ape is violent and he, Caesar, is peaceful and wishes to stop the warring. Yet, when the apes he is leading are in the middle of the wilderness, Caesar and his small crew murder an innocent father who is gathering wood and puts his hands up, asking for peace. Then, they take his young, mute daughter, Nova, and treat her as one of their own. While the movie goes on and on and on and is quite repetitive, most of the movie takes place with many of the apes in the concentration camp, and with Caesar’s contingent on the outside looking in and planning to rescue them. A total bore and a complete waste of time. * Wish Upon – Rated PG-13: This is like a modernized episode of “The Twilight Zone,” though not nearly as good. Still, as a lower budget thriller with no big name stars (except Ryan Phillippe, if you can still consider him a big name star), it’s entertaining and thrilling. And I liked the ending. A good deal of the movie is predictable, and there isn’t a lot new that you haven’t seen before. But I still liked it. There can never be too many “be careful what you wish for” movies. Actions have consequences, and teens and 20-somethings (at whom this movie is obviously aimed) see few movies and TV shows with that lesson. This is one of them. 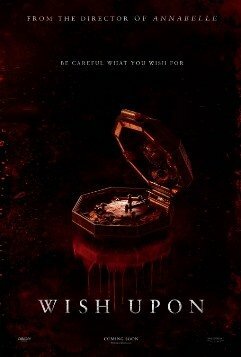 The story: Clare (Joey King) finds her mother dead by suicide, when Clare is a little girl. That wasn’t a necessary part of the story, though it fits in later. Next, we see Clare as a teen in high school. She is not one of the popular kids and is forever terrorized by the in crowd. They treat her horribly and sabotage every effort she makes to fit in. On top of that, she’s embarrassed because her father is a “picker.” He gets into trash bins searching for treasure and things to sell and recycle. To her chagrin, Clare’s dad even scavenges in the dumpsters adjacent to her high school–something for which the popular kids make fun of her. Clare also has a fabulously wealthy, elderly, eceentric uncle, who lives in the area in a giant mansion. Although her father tells her never to talk to the uncle, she does anyway. One day, Clare’s father finds a mysterious, interesting looking box that doesn’t open. It has Chinese letters on it, and since Clare is learning Chinese in high school, her father gives it to her as a gift. The only thing she can read is a notation that the box is a “wishing box,” and she has seven wishes. As you can probably guess, a teen–particularly an unpopular one yearning to be accepted–would waste wishes on stupid things. And so it goes. But also, wishes change the course of history. And with that, we see the “be careful what you wish for” part. This movie is a lot more violent and bloody than I expected. And, so, it’s not for kids and maybe not even young teens. It’s not a great movie or even close. Still, I liked the message of the movie, for the most part. Oh Debbie,Debbie.I’ve heard of directors forced to change scripts because of studio douchebags insistence.Maybe that happened here not of their choice but by someone who’s like the Weinsteins.If you think about it, classics like Gone With The Wind,Lawrence Of Arabia, and The Godfather have run that long or more.Still all the best to you. Good review and I pretty much agree with everything you said, except I wanted to point out that the apes did not shoot a man with his hands up asking for peace – he put his hands up and then pulled a rifle from behind his back. Love your movie reviews! They help warn me against supporting films that target America’s moral fabric. I am eager to read more of your reviews. The wish movie does seem to have a Twilight Zone or Alfred Hitchcock vibe to it. I love how in the Hitchcock TV series the bad guy’s plan always backfires on him/her. I have pre-ordered my DVD copy, which hasn’t been released yet, of the movie, “WAR FOR THE PLANET OF THE APES”, because I want to have the complete, “PLANET OF THE APES”, collection, which I enjoy watching. I view the, “PLANET OF THE APES”, movies as being a sort of parallel depiction of our society’s real-life under-reported violent racial hostility situation, with black people attacking white people across America, and in Africa, actually waging an unreported war of white genocide. I also see the same startling parallels in the novel, “NINETEEN EIGHTY-FOUR”, by George Orwell, with its emphasis on political correctness, government mandated media propaganda, and thought control, and the novel, “THE TIME MACHINE”, by H. G. Wells, with its uncannily accurate portrayal of our contemporary denial by whites (i.e., the “Eloi”) of the danger posed by blacks (the “Morlocks”). Probably the only person in the United States of America who is currently documenting and reporting the violent crimes being committed by black people against white people, and how it is being either justified, downplayed, or concealed by the media and the government, is Colin Flaherty, whom you can find on the Internet. Hi Abby! Thanks a lot of this review, I have the same impressions regarding the movie! I liked the old version of it, but this one is too long, boring and has lots of politics in it, what I don’t like. I like this resource because it always has good reviews that are worthy to read!